Alternators|Brandon, FL :: Scott's Automotive Inc. 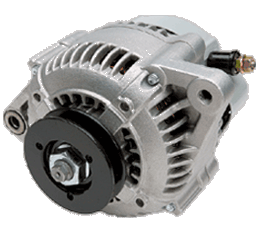 The alternator works with the battery to generate power for the electrical components of a vehicle, like the interior and exterior lights, and the instrument panel. An alternator gets its name from the term alternating current (AC). Alternators are typically found near the front of the engine and are driven by the crankshaft, which converts the pistons’ up-and-down movement into circular movement. (To learn more about the basic parts of car engines, read How Car Engines Work.) Some early model vehicles used a separate drive belt from the crankshaft pulley to the alternator pulley, but most cars today have a serpentine belt, or one belt that drives all components that rely on crankshaft power. Most alternators are mounted using brackets that bolt to a specific point on the engine. One of the brackets is usually a fixed point, while the other is adjustable to tighten the drive belt. Alternators produce AC power through electromagnetism formed through the stator and rotor relationship that we’ll touch on later in the article. The electricity is channeled into the battery, providing voltage to run the various electrical systems. Before we learn more about the mechanics of the alternator and how it generates electricity, let’s look at the various parts of an alternator in the next section.